Sue began curling during her high school years at the suggestion of Ella Reynolds (Curling Coach and mother of Delores Syrota). She started curling with the high school curling team and played the Second position her first year, the second year she moved to the Skip position and in her third year of school curling as Skip, won the 1973 High School Provincial Championship. She was in grade 12 that year. After her school years Sue went on to be a regular on the Saskatchewan women’s curling scene with many appearances at the Women’s Northern and Provincial competitions with various teams. A highlight of her curling career was defeating Vera Pezer at the Northern A final in 1981 and earning a berth to the Provincial – this was huge! At the Provincial Championship in Prince Albert, curling with Gloria Leach, Delores Syrota and Joan Sweatman, Team Altman won the 1981 Saskatchewan Ladies Curling Assoc Provincial Championship. The Team represented Saskatchewan at the 1981 Canadian Ladies Curling Association Championship, nicknamed “The Lassie”, as the 21st edition of the Canadian women’s national championship. 1981 was the final year before Scott Paper began sponsoring the event. It was held at Memorial Stadium in St. John’s, Newfoundland and Team Altman finished with a 6 – 4 record. A very respectable showing for first time Provincial Champions, Team Saskatchewan! Sue has always had a “competitive edge for the sport but states- FUN HAS GOT TO BE FIRST– then competitiveness comes after. She states she has had a LOT of fun over the years curling! Her favourite thing about curling is: “going to the lounge”. Her least favourite thing about curling is “ bad sportsmanship” and her advice for young curlers, is to put down the phones, pick up a rock and get off the couch! 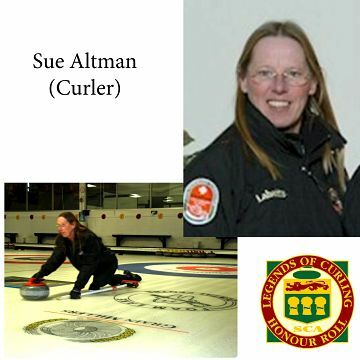 Sue is still curling in the local club in Foam Lake and is a HUGE supporter of youth programs and events, not only by helping but by sponsoring young curlers. She has her SPOT in the lounge in Foam Lake and ALL curlers know that that spot is for Sue! She is highly respected as a curler, a person and a valuable contributing member of the Foam Lake Curling Club. She also actively participates in fundraising to help keep the doors open! Sue, a genuine character, loved to compete, always had fun and she valued the sportsmanship of the game. Everyone enjoyed Sue as well. For a number of years Sue would bring her “door prize” to competitions. A REAL door! Then throughout the competition she would have all the Teams sign it. A history of Saskatchewan Women’s curling is on that door!